GuitarControl.com released a new video guitar lesson from GuitarControl.com instructor and creator Claude Johnson. In this guitar lesson, now available on YouTube.com, Claude Johnson teaches a common jazz chord progression. Claude teaches this easy jazz lesson in the key of G using the 2 5 1 chord progression as follows: for the 2 chord, Am7 (A minor seven), for the 5 chord, D7 and for the 1 chord, GM7 (G major seven). Typically the 2 5 1 chord progression consists of one bar of the 2 chord, one bar of the 5 chord and two bars of the 1 chord, but in this demonstration, Johnson only plays one bar of the 1 chord and follows it with one bar of the 6 chord which is E7. “That gives it a really nice twist,” says Johnson. “Normally it would be a minor chord, but in this case we are giving it a temporary dominant.” Claude demonstrates how you can solo over this progression using the G Major Scale. Guitar tabs are available for this easy beginner jazz guitar lesson at GuitarControl.com. The major scale, aka the Ionian Mode, is a seven tone diatonic scale that is widely used in western music. The eighth duplicates the first at double its frequency so that it is called a higher octave of the same note, which its name is derived from Latin "octavus," the eighth. Claude Johnson, a native of Philadelphia PA, began playing guitar in 1990 after being inspired by players like Jimi Hendrix, Eric Clapton, and Stevie Ray Vaughn. 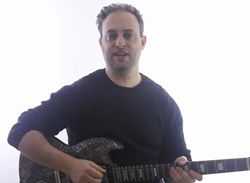 He is the creator of GuitarControl.com and has helped 1000s of people to learn to play the guitar with his critically acclaimed instructional DVD courses, all available at GuitarControl.com. GuitarControl.com is the leader in modern guitar instruction. It’s packed with recourses including articles, video lessons, and the best videos in the business for the beginner to the advanced guitar student taught by the best instructors out there. Whether you are into the blues, rock, jazz, metal, folk, or anything in between, they have you covered.